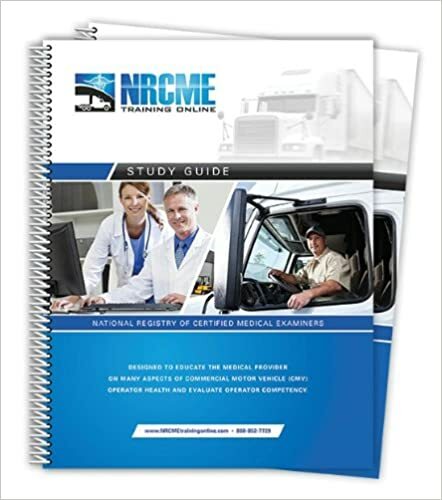 The NRCME Training course is for MDs, DO, DCs, etc to get the knowledge to be the certified medical examiner and apply the FMCSA driver physical qualification standards. The usual completion time for the course is 12 hrs and the course will be conducted online. Who could have thought that the certified medical examiners have a major role in reducing the risk for fatalities and crashes that happens with the commercial motor vehicles. The certified medical examiners are much in demand to determine the fitness of the interstate trucks and bus drivers. But many of the medical examiners do not know about the specific physical demands on these drivers. As per the latest rule released by the Federal Motor Carrier safety Administration (FMCSA), all the medical examiners must complete training about the FMCSA’s physical qualifications regulations and about the advisory criteria and must pass the FMCSA certification test conducted by the National Registry. NRCME is the National Registry of Certified Medical Examiners and the certificate that is issued makes the medical officer qualified to do the fitness test of the drivers. Oakstone makes this certification course online and fast enough to finish it in 12 hrs of needed. There are some eligibility criteria for the National Registry Certification exam. The candidate should have a valid and current medical license, certificate or registration in that jurisdiction where the examinations will be performed, and the state laws and regulations are applicable. Should obtain a personal National Registry number from the FMCSA by registering at the NRCME. Should complete the NRCME Plus online training and get the certificate of completion. Register and pass the FMCSA National Registry certification exam an FMCSA approved organization. For appearing for the exam the candidate should have the US driver’s license, medical practice license, and the certificate for NRCME plus online training System completion. Upon completion of the test and passing it will get you the medical certification valid for 10 yrs and will be listed in the National Registry that is accessible to drivers, motor carriers, and public. This qualified MRCME examiner will report the results of the driver exams monthly, the periodic monitoring and audits will be conducted, maintain the certification periodically every 5 yrs and retake the exams every 10 yrs. With the increase in number of CMV drivers there is no enough medical examiners and there are still more than 40,000 examiners in need. In order to make the driver be declared fit even the medical examiner also has to be qualified enough. The drivers are mostly aged and may have many chronic disease, sudden incapacitation etc. Only the team work of both the qualified medical examiners and the fit drivers can make sure that the highways are safe. The NRCME course has 27 modules with both pre and post tests for each. On completion of the course the certificate of completion can be immediately printed out and is eligible for appearing for the FMCSA medical examiner certification test. This course will also provide 12 AMA credits as part of CME. The access to the training course is unlimited throughout the period of the course. The candidate can complete it in as much time as possible but together will be completed in 12 hrs. there will be pre-tests, post-tests and 26 quizzes to practice. The 27 modules will be in more than 1000 slides and the practice questions & answers will be free to access. The training course can be accessed from a mobile device also. There is an auto save feature and there is no need for an audio or flash player to play the slides. The main advantage of this course is that it is time unlimited. There is no time limit to complete the course and the candidate can take their own time to complete it. The questions and answers deck contains more than 550 practice questions. The access to the online resource library comes with the registration for the course. It supports the course and can serve as a reference throughout as a certified medical examiner. The documents in the library are in PDF format that can be downloaded or printed with ease. The flexibility in the timing is very convenient and one need not spend money on travelling. There are post module quizzes as well. The NRCME Plus online training system has got the accreditation as a continuous medical education status and also from other categories. The American Association of Nurse Practitioners, the American Academy of Physician Assistants, Providers of Approved Continuing Education, all accredit this course. Completing the course does not make a certified medical examiner and it is just an eligibility criterion to attend the certification examination. There are 27 modules and each module deal with one medical category. The modules are introduction to National Registry, FMCSA background & structure, definitions & regulations, CMV driver & public safety, diabetes, hearing, vision, hypertension, neurological, cardiovascular, vascular disease, non-CHD cardiovascular diseases, respiratory/obstructive sleep apnea, musculoskeletal system, psychological, substance abuse, other diseases & disorders, medication rules and performing the physical exam. The pre-tests are to assess the knowledge before starting the online training system. The quizzes that follow each module cover the key concepts. A final exam will be conducted on completing the modules. This final test will make the candidate prepare for the National Registry exam. Most of the candidates pass the medical examiner certification test in the first go itself. But in case of failing the test the candidate can opt for a retest but will have to wait for at least 30 days. The initial exam must be appeared for within 3 yrs of completion of the NRCME course. A fresh medical examiner certificate will be issued after every re certification. There is a group training course for a group of people at hospitals and medical institutions. Wherever the location is the training is done online. The online training system will be tailored to suit the group and integrates with the learning management system. There is the multi view reporting also. The registration will be separate for each individual in the group but the classes are common.